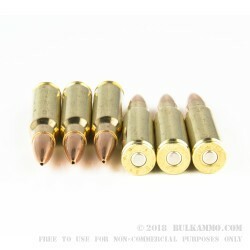 These .308 Winchester rounds from SSA feature a 175-grain hollow point boat tail projectile, loaded into boxer-primed, noncorrosive reloadable brass cases and are capable of a muzzle velocity of 2500 FPS. 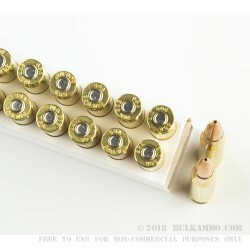 Made to be incredibly accurate with their boat tail design and Nosler bullet, these .308 rounds deliver match grade performance and excel at putting holes in paper or clanging steel targets at long-rang. Each round of Silver State ammunition is visually inspected before being shipped and are created to cycle consistently in semi-automatic rifles. 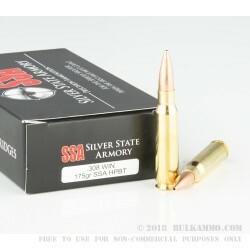 Each box of Silver State Armory .308 Winchester contains 20 rounds. 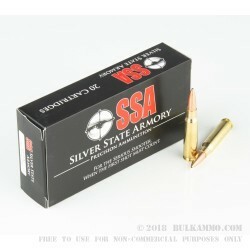 Silver State Armory, now a part of Nosler, produces highly effective and reliable ammunition for an abundance of applications. Acquired in 2013, by Nosler to meet the high demand for ammo and reloading supplies these rounds feature Nosler projectiles known for performance in anything from match shooting, to varmint hunting and self-defense.